Ishimoto Yasuhiro is a leading Japanese photographer who captured cityscapes of Chicago and Tokyo, children, and the Japanese traditional architecture of the Katsura Imperial Villa and Ise Jingu Shrine, in photographs combining warmth and exacting picture composition. Following is a brief summary of his career that is intended to serve as a basic introduction for all those unfamiliar with Ishimoto Yasuhiro, and as a reminder for those familiar with his work. Ishimoto was born in 1921 in San Francisco to Japanese parents, father Toma and mother Mine, who had immigrated to the USA. When he was three years old, his family returned to his parents’ hometown Tosa in Kochi Prefecture. The susceptible adolescent years up to his graduation from Kochi Prefectural Agricultural High School he spent in Kochi. In 1939, after graduating from high school, he went to the USA to study large-scale modern agriculture. After the outbreak of World War II shortly afterward, Ishimoto was sent to a Japanese-American internment camp in Colorado. Before the end of the war he was only permitted to reside in the inland region, and eventually settled down in Chicago, Illinois. From the various things he encountered there, Ishimoto chose to focus on photography, and enrolled at the Institute of Design (aka New Bauhaus) in Chicago, where he engaged in serious studies of photography. His teacher was Harry Callahan. Here Ishimoto thoroughly honed the formative sense that would later characterize his photographic work, and received the Moholy-Nagy Prize, which was awarded to excellent students within the school, twice. He went on to focus especially on the cities of Chicago and Tokyo, resulting in numerous accomplished works that have been fascinating many a photography aficionado. In 1996 he was selected as a Person of Cultural Merit, and has since been highly acclaimed not only in the realm of photography, but also in the fields of design and architecture. With new times came new media. Today, with photography itself becoming more varied, the world of black and white in which Ishimoto authentically frames the scenery as it appears in front of him while approaching his subject head-on, exhaustively communicates the fascination of photographs as products of light and shadow. In recent years, Ishimoto has repeatedly taken back shots of people within the hustle and bustle of the city. In October 2004, it was decided that all of Ishimoto’s existing works, films and other precious materials were to be donated to the Museum of Art, Kochi. The exact figure is yet to be determined, but it is estimated that the total number of items amounts to about 7,000. The author intuitively felt that there certainly exists no other photograph that represents the image of the big topic of the donation better than this one. The marvelous, unbelievable news seemed to have come fluttering into Kochi on the wind just like this newspaper, and the two pages seen in the photograph are in a way reminiscent of Mr. and Mrs. Ishimoto, who have been together for half a century. The photo was taken in Chicago sometime around 1960. Even though it doesn’t show much more than pages of a newspaper whirled around by the wind, it is indeed one smart and refreshing picture. 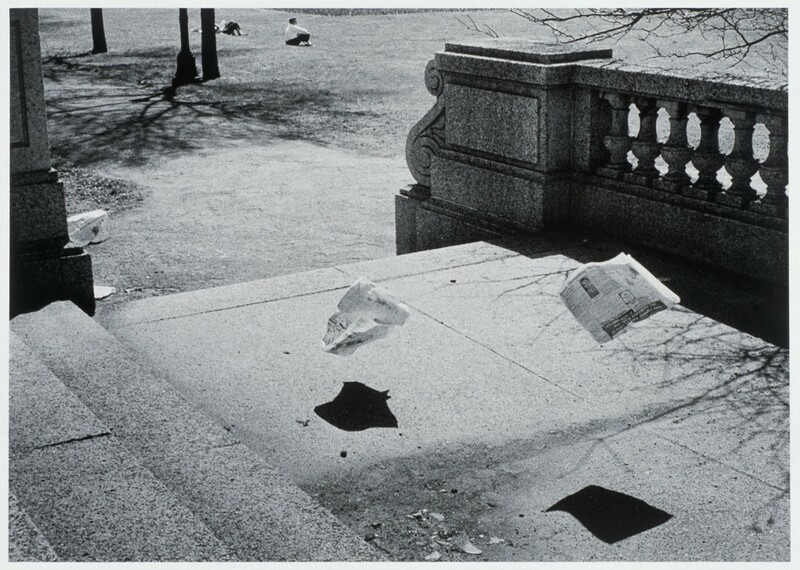 Ishimoto stumbled across the scenery of the whirling newspaper while taking a stroll in the Grand Park near the museum in Chicago. He reportedly chased after the papers for about an hour while taking numerous shots until he finally managed to capture the moment in which both pages were floating in the air in the perfect position. The newspaper did dance after his choreography. Chicago is also called the “Windy City”. This photograph is a symbolic representation of Chicago.